The first disc dedicated to the works of Alfred Schnittke on BIS was released in 1987, and has since been followed by 23 other titles, including a large part of his chamber music as well as the symphonies and other orchestral works. That first disc featured Concerto grosso No.1 in the original version for two violins and strings – the work which to some extent became Schnittke’s breakthrough in the West in the late 1970s. On the present disc that same work is heard again, but now in a world première recording of Schnittke’s own version with solo parts for flute and oboe. Soloists are Sharon Bezaly and, on the oboe, Christopher Cowie , making his first appearance on BIS. They are supported by the Cape Philharmonic Orchestra conducted by Owain Arwel Hughes, a team that collaborated already on the most recent Schnittke title in the BIS catalogue. Released in 2007, that disc contained a previously unrecorded youth symphony (‘Symphony No. 0’), and caused considerable attention. The possibility of tracing the very beginnings of Schnittke’s highly original talent intrigued many, and the orchestra’s performance impressed critics all over the world. 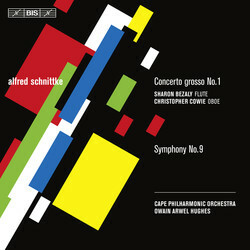 ‘The Cape Philharmonic Orchestra performs this opulent score in Technicolor’ wrote the reviewer in the French magazine Diapason while his colleague in American Record Guide remarked that ‘the South African orchestra plays its heart out, with the score favoring its very good brass section’, and went on to describe the disc as ‘one of the more interesting releases of the year to date’. Hughes and his orchestra now close a circle by the recording of Schnittke’s last symphony, Symphony No. 9. Written during the composer’s final years, and after Schnittke had suffered a serious stroke, the autograph score was so difficult to decipher that it had to be reconstructed after the composer’s death – a painstaking process which was crowned by a first performance in 2007. With the present recording the full cycle of Schnittke’s Symphonies is available on BIS.